Do you feel that your family is not what it used to be, or what it has the potential to be? Do you worry that the parenting decisions you're making today may be scarring your child for life? Do you sometimes feel you are in a tug-of-war with the world over who will shape your child's values and beliefs? With "Family First: Your Step-by-Step Plan for Creating a Phenomenal Family," Dr. Phil offers a new classic on family life -- and gives parents real answers and a plan for being the most positive and effective parents possible. Starting right now, you can begin to make realistic choices and take day-to-day actions that can make your family phenomenal. You must decide that you will lead your family with strength and love and that peace and joy are not just for the people next door or on TV. They're for your family. 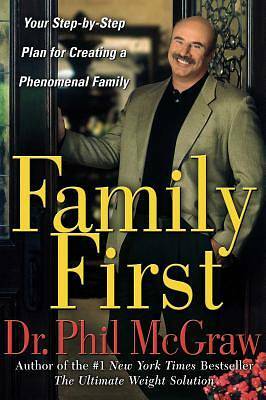 In "Family First," Dr. Phil gives it to parents straight: even in this fast-paced world your family should be the center of your life and your child's life. Parenting is the most important and noble act you will ever undertake, yet American families are threatened like never before from the inside as well as the outside -- many of us fight too much, don't get involved enough in our children's lives, or get bogged down in life's daily struggles instead of keeping our eye on the big picture of our family's well-being. Dr. Phil has been working with families for over twenty-five years to help them repair the fissures that have fractured their home lives. In "Family First," he provides a proven action plan to help parents determine the strengths and weaknesses of their parenting style. His 7 Tools for Purposeful Parenting cover the most important elements for anyparent: parenting for success -- for the purpose of raising cooperative, caring, and competent children. Exercises, scripts, assessments, solutions for specific problems, and precise directions for implementing the steps you need to take are all included in this landmark work. Dr. Phil shows parents how to make changes now -- how to put a stop to your children's tantrums; talk to them about peer pressure or self-esteem; instill values like integrity, honesty, and respect for other people; and bring order back to your house. If you want your child to have a happy, fulfilled life, you must open your eyes to the crucial role you play in his or her development. Most important, Dr. Phil's new book offers you and your family hope -- for a phenomenal home life now, and a productive, fulfilling future for your children. As Dr. Phil says, you are not just raising children, you are also raising adults, and everything you do today impacts what kind of adult your child will become. You are building the future.